In the Henry Moseley X-ray Imaging Facility at The University of Manchester, the unique versatility of the Nikon CT systems enable its staff members to take on a great range of research and commercial projects. Nikon CT systems have been installed in the facility for almost 20 years, and they remain the workhorses of the facility today. The University of Manchester has been using Nikon CT for almost 20 years. The first system – an XT H 225 - was installed in the year 2000. Following this first investment, the Henry Moseley X-ray Imaging Facility was established in 2003, based around the capabilities and the flexibility of the XT H 225 and the newly built Nikon 320 kV large-envelope system. Subsequent installations followed, and today, there are 11 imaging systems in the X-ray Imaging Facility, three of which are Nikon systems. The three Nikon systems include the original XT H 225 cabinet system, a custom built large-envelope system with exchangeable 225/320 kV micro-focus sources, and the XT H 320 large-envelope system complete with 16bit detector. The Nikon CT systems are the workhorses of the facility and take on the majority of inspection projects. Both large-envelope systems have the capacity to hold specimens up to 100 kg and can comfortably scan large samples, but the high-flux X-ray targets enable high-speed scanning. These large envelope systems have the capacity for sizable in-situ rigs which help to conduct time lapse studies. The original XT H 225 is on the other end of the spectrum, specialising in scanning much smaller samples but still giving quick results. The versatility and the reliability of these systems has seen them take on a wide range of projects from the first installation to the present day. The Nikon systems offer unique customisation and the interchangeable sources make them adaptable to various sizes and densities of samples. Learn more about Nikon Metrology X-ray and CT systems. 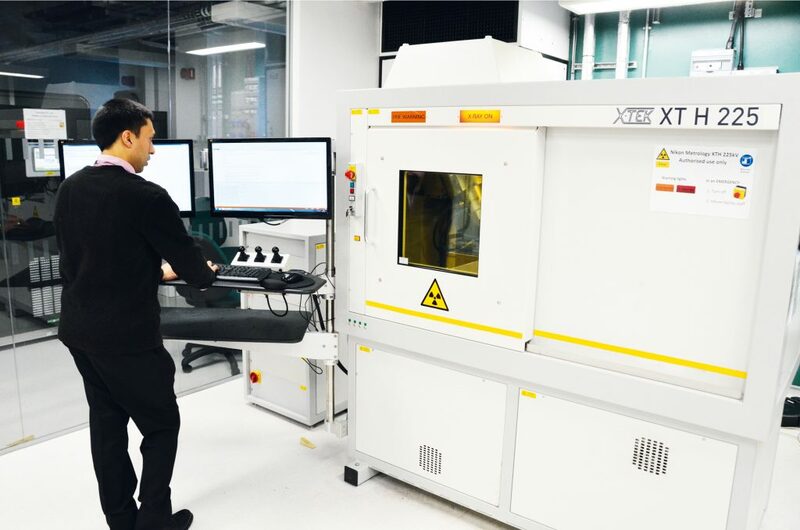 One standalone XT H 225 and two X-ray walk-in rooms give researchers unique flexibility in scanning components of various sizes and densities for research and commercial projects. Large walk-in bays and customs setups are perfect for IPC development and 4D-CT time-lapse studies. 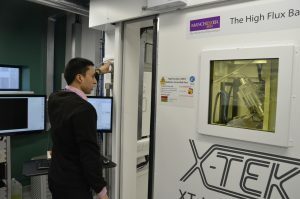 Parmesh Gajjar, Reasearch Associate at the Henry Moseley X-ray Imaging Facility closes the door on the XT H 225 WIR (walk-in room).The facility is open to external companies, for sub-contract inspection in industrial applications as well as the standard research projects. There are a lot of high-end investigations that take place, however there are also often new users. The facility was initially opened for research, but from the start it was obvious with such a novel capability that there was an opportunity to help a range people complete various projects. Tim Burnett, Deputy Director of the Henry Moseley X-ray Imaging Facility explains that the ease-of-use of the Nikon Metrology CT systems is why they are perfect for first time users. That, combined with the versatility of the systems makes them the go-to machines. “The XT H (225) and the large-envelope systems are perfect for exploratory work because they are quick. With a large range of energies they are able to look at a lot of different materials and samples”, Tim Burnett, Deputy Director of the Henry Moseley Facility. 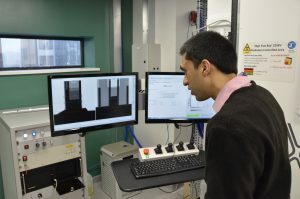 With such a broad spectrum of capabilities in the facility at the University of Manchester, and a wealth of expertise available, the laboratory serves to support industrial projects. One member of staff at the Henry Moseley facility is currently working full-time with the industrial customers who come to the facility. Although run as a service, the projects are still largely research based, with investigative analysis being the main field of work. More mainstream inspection projects include analysing composites and failures in metals and looking at defects in additive manufactured components. A lot of people are now starting to understand what is possible, and people want to come and work with the staff at the Henry Moseley Facility to discover more for themselves. This has led to a number of cultural projects, with the Facility working closely with museums to scan a range of artefacts. For example, the CT systems have helped reveal the contents of ancient mummies and helped check the authenticity of the Jules Rimet football world cup trophy. Tim Burnett, Deputy Director of the Henry Moseley Facility. To look at how well the shape of the final component resembles that of the design, looking at the tolerance of design and any distortions which take place in manufacturing. Looking for internal defects and voids which are often part of the manufactured product. Some of these are large inter-particle voids due to incomplete sintering and others, much smaller voids are that could have been present in the original powder. These additive manufacturing research projects are all part of working towards the optimisation of micro-structures. A large part of that is getting rid of the defects. With Nikon Metrology CT, non-destructive inspection of additive manufactured components is taken to the next level, providing the inside insight. It is the optimal solution for assuring internal and external geometry by revealing defects, porosity, contamination or cracking. By using Nikon CT, manufacturers have much more confidence in the final component, and researchers can work towards the optimisation of these micro-structures. The three Nikon systems offer a unique flexibility, and complement each other in their capabilities. The scale and speed of the systems means the facility is able to take on plenty of new challenges as well as the researchers own projects. These research projects include exploiting the IPC (inter-process communication) interfaces, which will be looked at closer in an upcoming story with Parmesh Gajjar, Research Associate at the Henry Moseley X-ray Imaging Facility. IPC opens up a whole new range of possibilities and ways in which users can get the most out of a system. the growth of the specimen can be illustrated in a video made from the individual time-lapse CT scans, a 3D version of time-lapse photography. "IPC enables a new degree of flexibility of Nikon CT systems that is an invaluable asset for scientific research." Parmesh Gajjar - Research Associate at the Henry Moseley X-ray Imaging Facility. Parmesh observes the results of the mechanism which shakes the beads at intervals between CT scans. “The XT H 225 and the custom bay, and increasingly so the high-flux bay, are very much the workhorses of the facility. They are very heavily used by internal and external academics, as well as commercially”, Tim Burnett says. With commercial work accounting for approximately 20% of the activities at the Imaging Facility, the custom bay serves as one of the main tools. Tim explains that there is a huge range of components which can be scanned using this system, from meter size objects down to millimetre sized objects. Not only have the systems been there for a long time, they are used pretty much 24/7, and commercial work is a large chunk of that. The range of component scale, the energy range and speed means the Nikon systems are capable of completing tasks that other systems can’t handle. Another benefit of the Nikon systems’ versatility is that more often than not, they are able to say yes to commercial requests, which otherwise would have to be turned down. So long as the component is within the size and density range, people needing a quick answer have often been satisfied. Components can be scanned in less than an hour and reconstructed to take a closer look at. Tim adds that only Nikon systems are capable are carrying out such tasks as quickly; they are perfect for taking a first look in these circumstances. With these Nikon systems, The X-ray Imaging Facility is able to take on more industrial work, and carry out inspection tasks much quicker and successfully than would be possible with other machines. 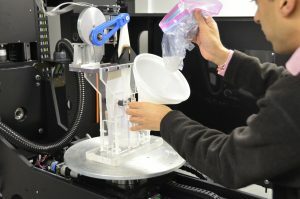 The range of component scale, and the range of energy sources make it possible for various objects to be scanned, and reconstructed very quickly. In summary, the Nikon CT systems are an invaluable part of the Henry Moseley X-ray Imaging Facility, with the unique customisable ability providing staff and academic researchers with endless possibilities. A study of additive manufacturing and the use of CT, between University of Sheffield and University of Manchester - The Influence of Porosity on Fatigue Crack Initiation in Additively Manufactured Titanium Components.